Sales Funnel: simply a way to think about all the steps in the sales process and to be able to log them so that you can avoid a sudden dip in sales. If the sales funnel is not topped up at every stage, the rate of signing contracts will be similarly affected. 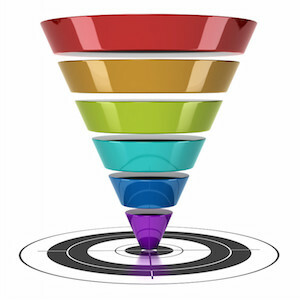 Here is an example of what the various levels of the sales funnel might represent. You will see, and know from your own experience, that there is an attrition of prospects at each stage of the sales process, as the sales funnel narrows towards a paid invoice. 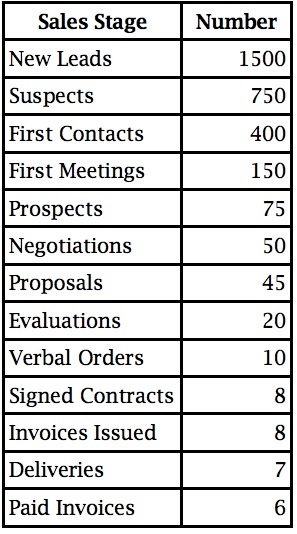 So don’t simply track sales, track events at each stage of the process. The reason it’s important to track the numbers at each stage of the sales funnel is that dips in the numbers at the top of the chart will inevitably lead to smaller numbers at the crucial bottom end, where the rubber meets the road. If the number of sales suspects is dipping, or the numbers of first contacts is slipping (at the early stages of the sales process), it is much easier to take the necessary actions. Such actions could be upping the promotional spend, to correct the trajectory, for instance. Lower down the chart (or sales funnel), it may be too late to take corrective action in time to keep sales at the desired level. Like a sailor constantly watching his sail, you need to monitor sales volume, so that like the sailor changing course when the wind shifts, you can take corrective action before it’s too late. I encourage founders to keep their eye on leading indicators, rather than lagging ones like sales, but they must nonetheless check performance against budget. Variance Analysis is the way to do it with sales. Use the Goal Tracking Tool to keep your eye on goals. Take care, though that you are tracking the right things. One way you can do that is to be sure that you are watching the right Key Performance Indicators. Of course your own sales process will be particular to you, and what happens at each stage of the sales funnel will be different, but the principle will remain the same. You will be well advised to use CRM (Customer Relationship Management) software, which will automate the whole process. Entrepreneurs I have mentored have used Insightly (you can have it free, for only one or two users), but there are many others. Many will connect directly with marketing apps, like Mail Chimp. Find the one that suits you best.